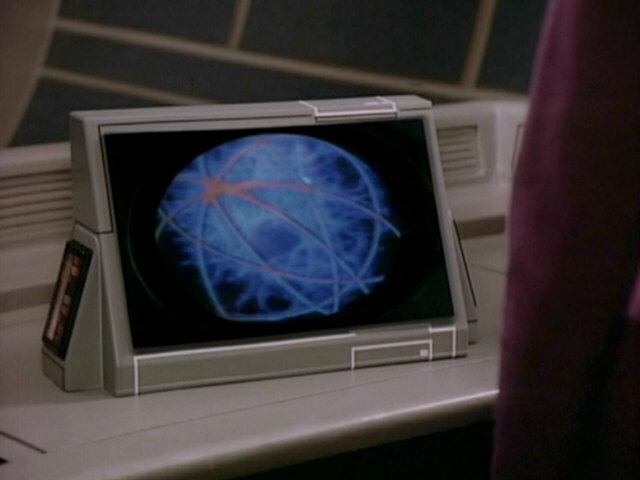 Ex Astris Scientia - Observations in TNG: "Shades of Gray"
Observations in TNG: "Shades of Gray"
Here are some observations about sets, props and visual effects in TNG: "Shades of Gray" without a specific theme, and a comparison of the original TV release (TNG) with the remastered episode (TNG-R). 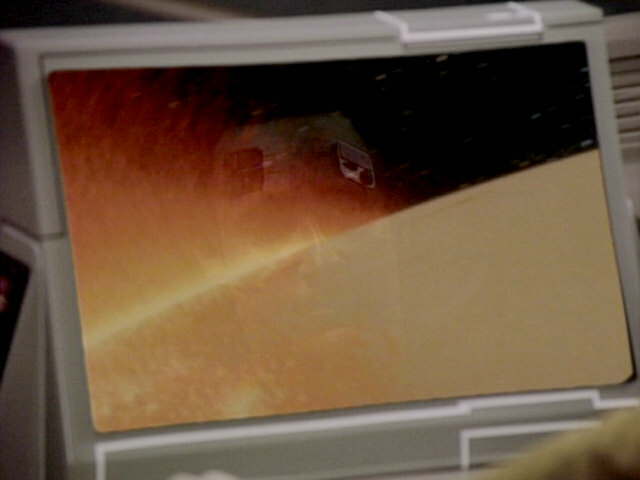 It seems part of the image in the top left corner is cut off in this shot. 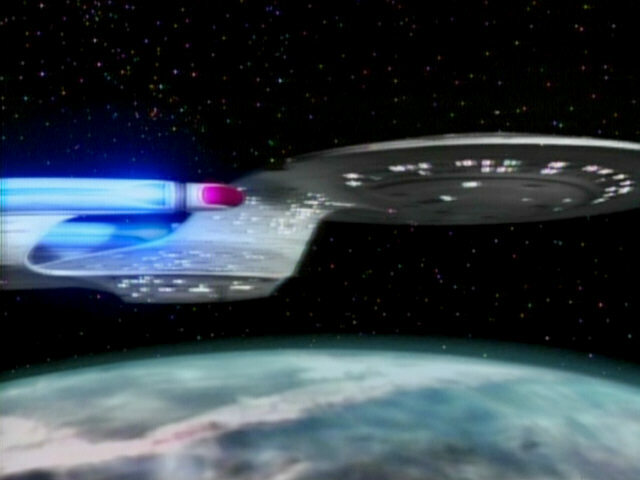 The shortcoming is no longer present in TNG-R.
Surata IV previously appeared as the planet housing Starbase Montgomery in "The Icarus Factor". 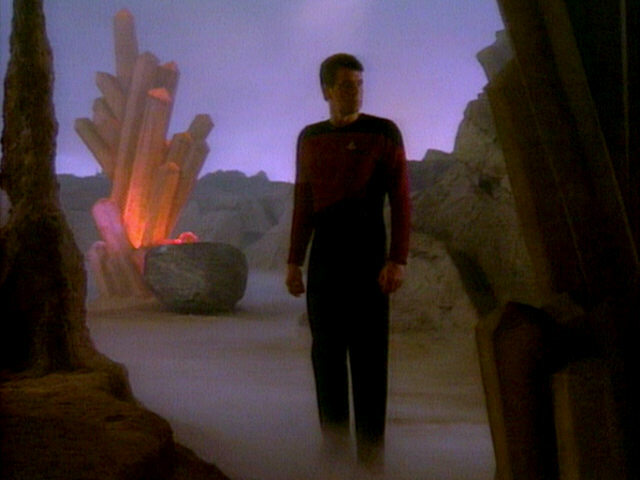 This planet will be re-used in countless TNG episodes in later seasons. 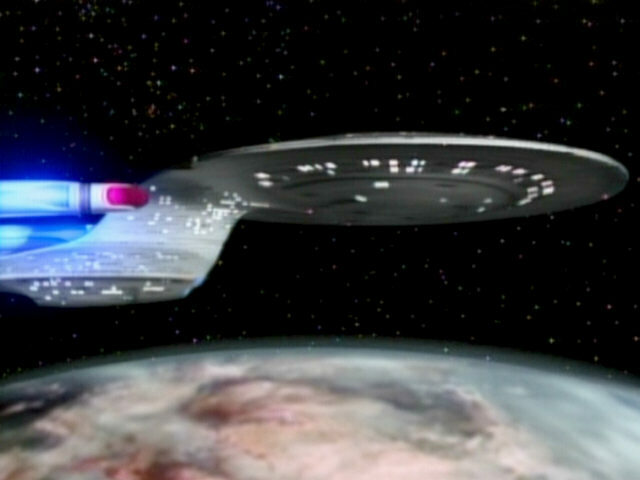 In TNG-R this shot is still identical to the corresponding one in "The Icarus Factor", including the distorted Enterprise and the Gulf of Sidra in the Mediterranean Sea just below the deflector dish. 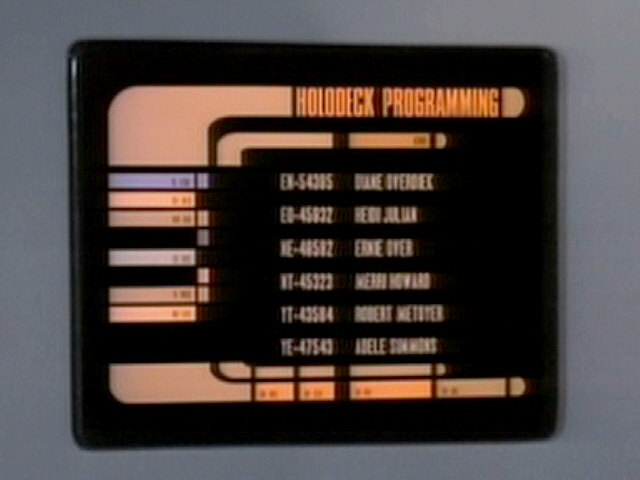 Okona" We can now read the names of people of the TNG production staff in the field above the round control block. 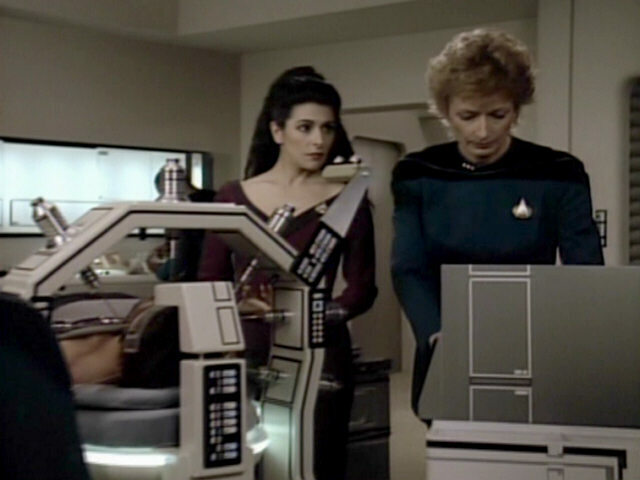 It is the list that also appeared in "The Outrageous Okona" in the original version, not the updated list of TNG-R. 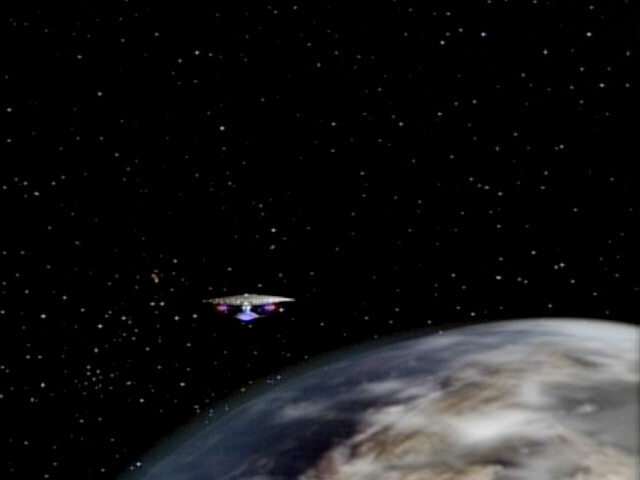 This view of the planet did not appear in "The Icarus Factor", even though the same shot of the USS Enterprise-D was used. 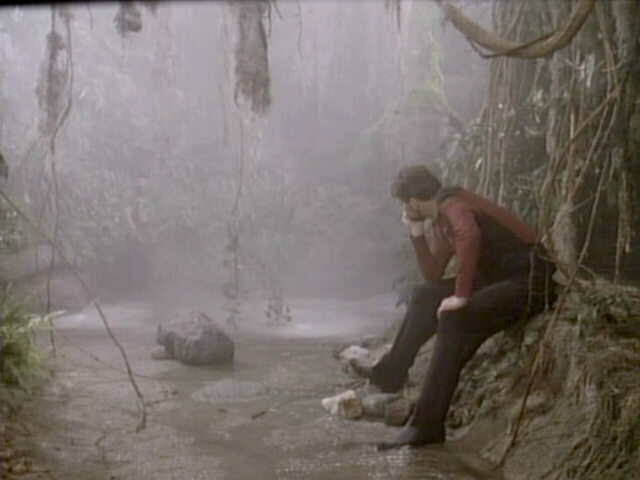 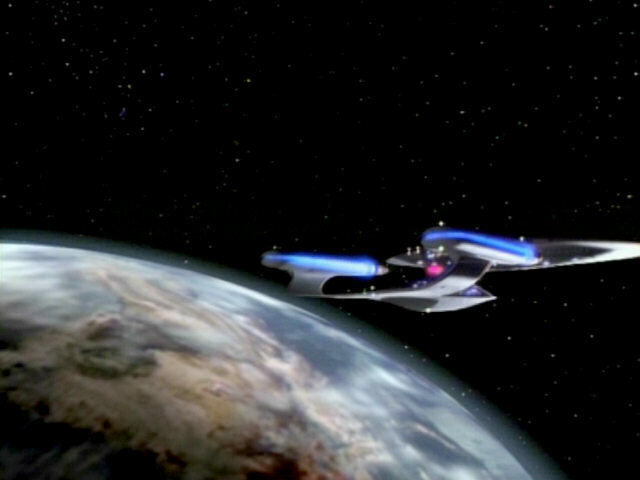 Factor" This shot shows the same planet "Earth" as in TNG-R: "The Icarus Factor" from a different angle. 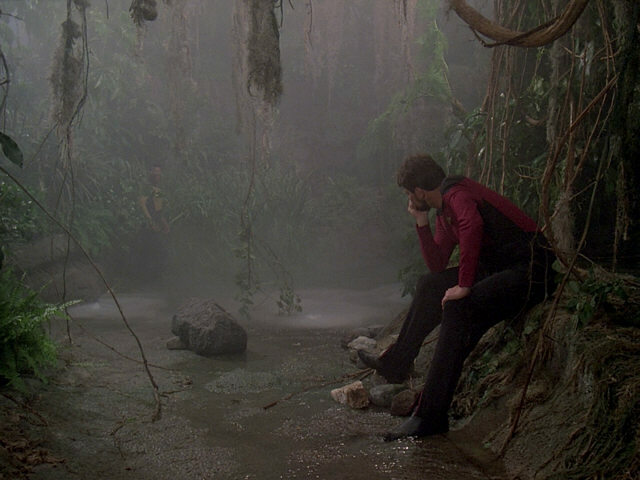 We can recognize a partial outline of the Great Lakes in the right half, but with parts of Ontario and New York submerged. 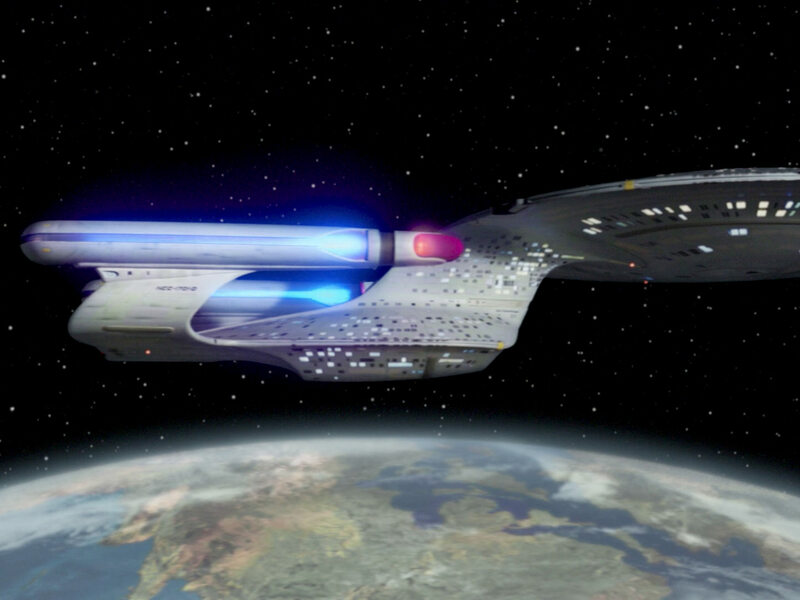 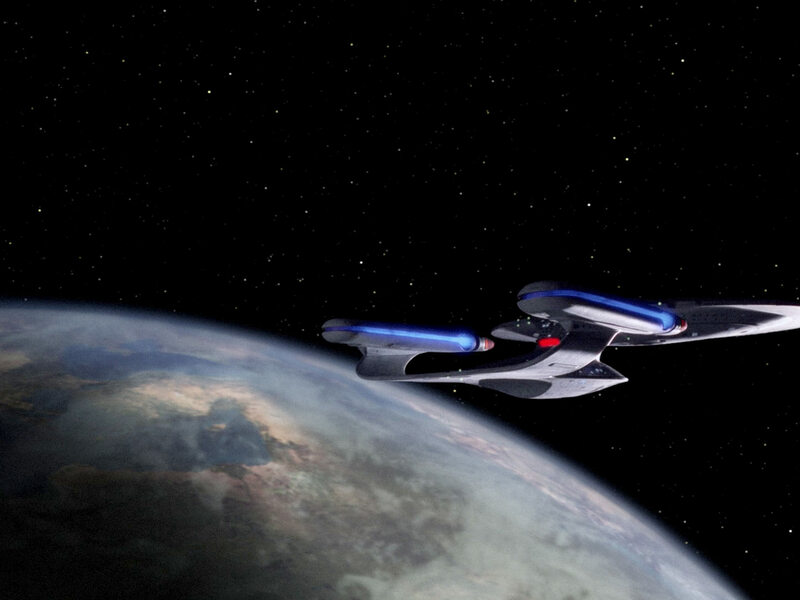 Another shot of the USS Enterprise-D in orbit of Surata IV. 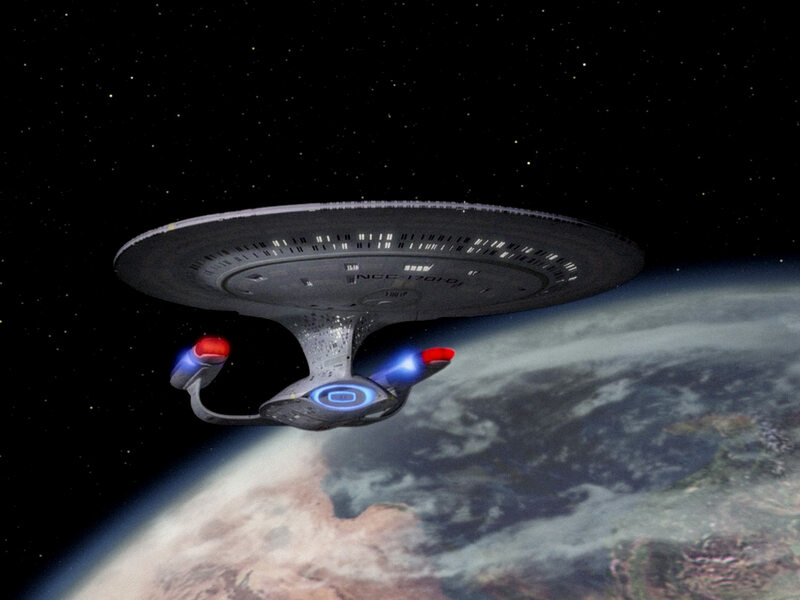 The planet from another angle. 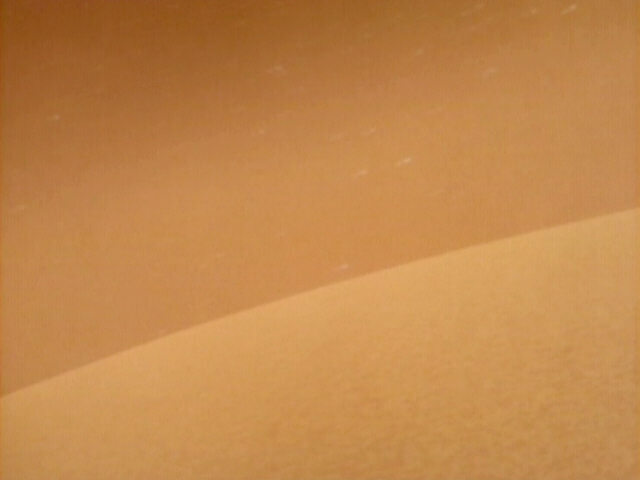 As already in one shot in "The Icarus Factor", we can see the whole eastern part of the Mediterranean Sea. 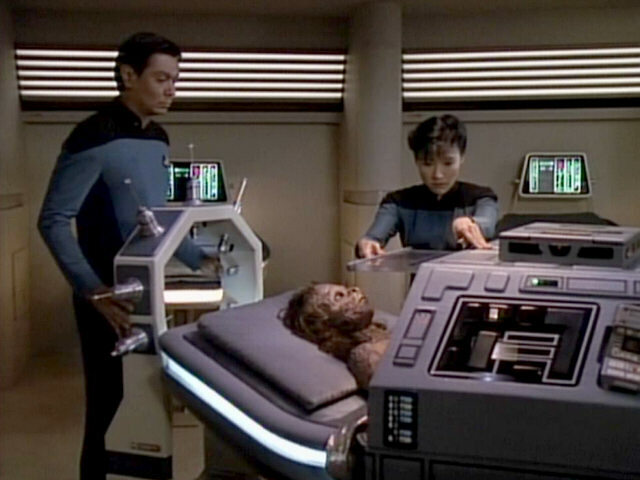 The medical console made its first appearance in "The Schizoid Man" during Data's psychotronic stability evaluation. 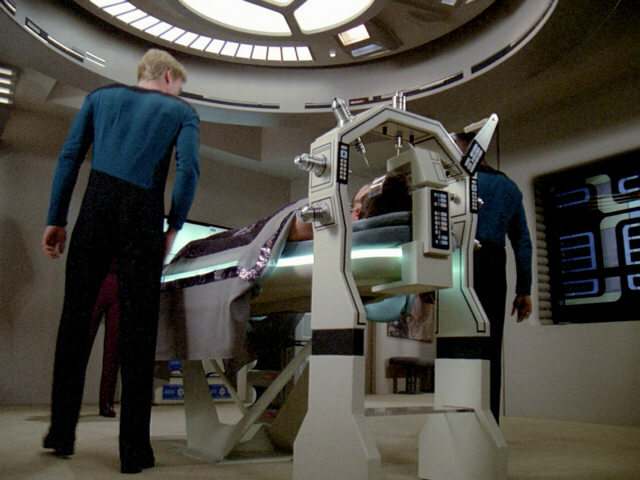 The medical scanner in front of it will be used momentarily. 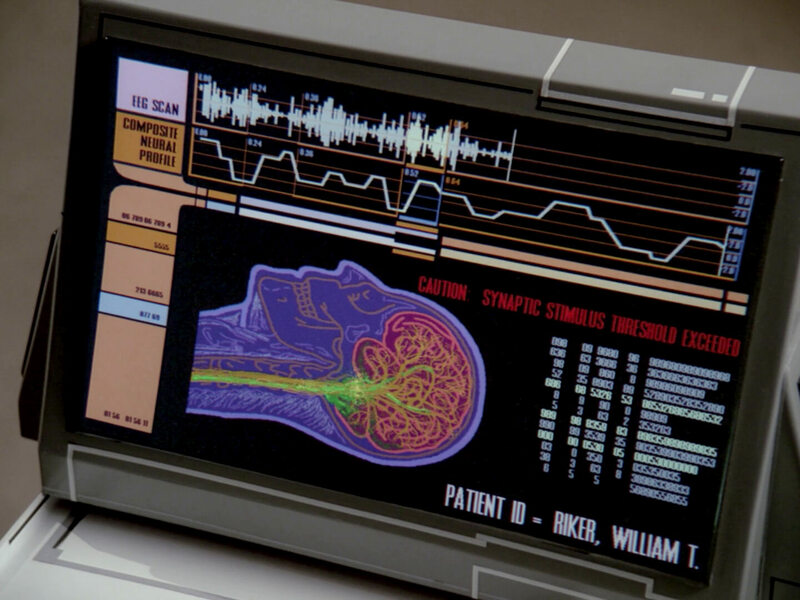 Man" The medical scan can be seen much better in HD. 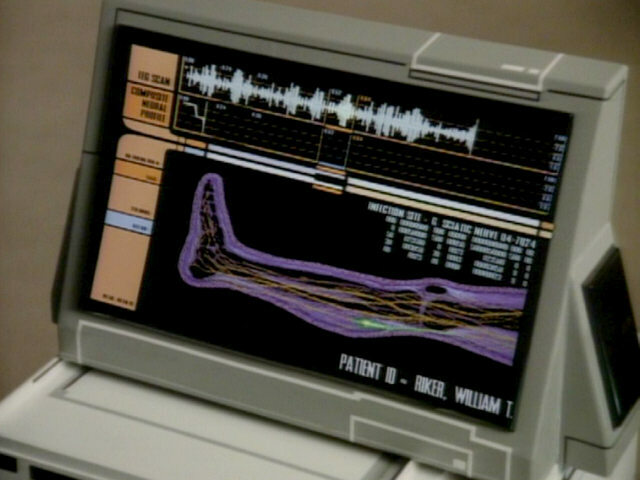 Doctor Crusher also used this medical tool to scan Picard in "The Inner Light" and Hugh in "I, Borg". 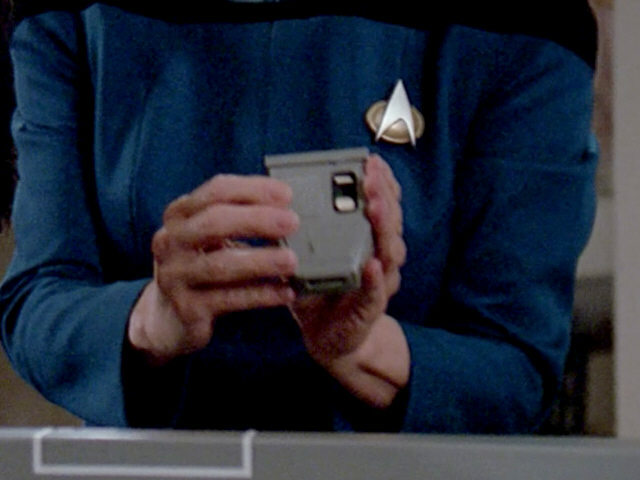 "I, Borg" A close-up of the prop in HD. Another look at a scan of Riker's infected leg. 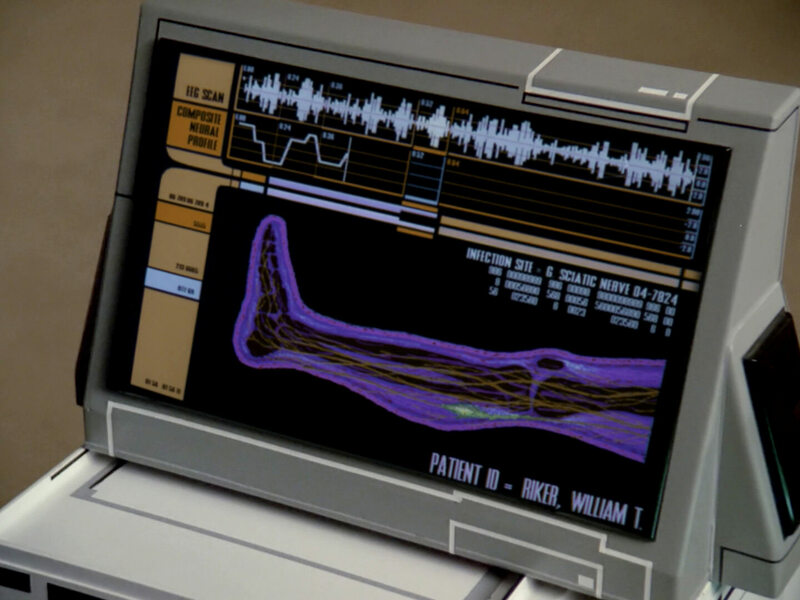 We can recognize more details in HD. 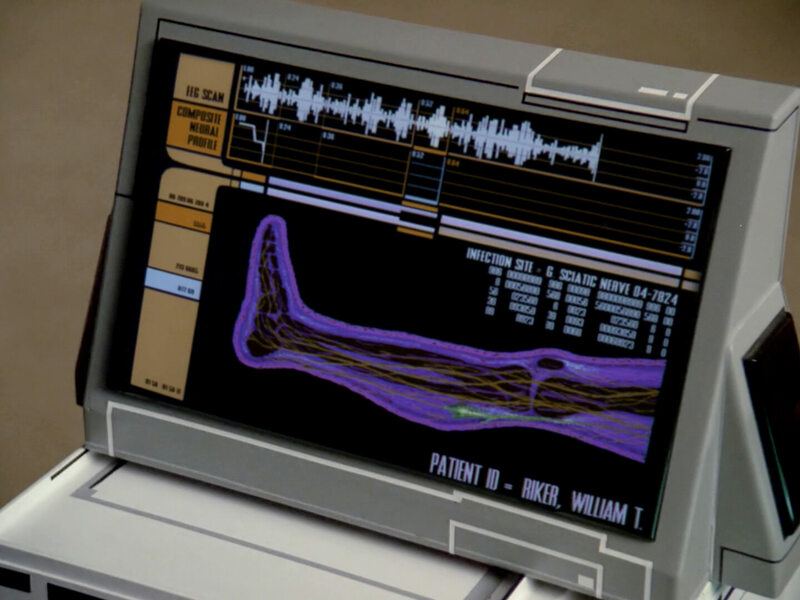 The list of medical tests run on Riker. 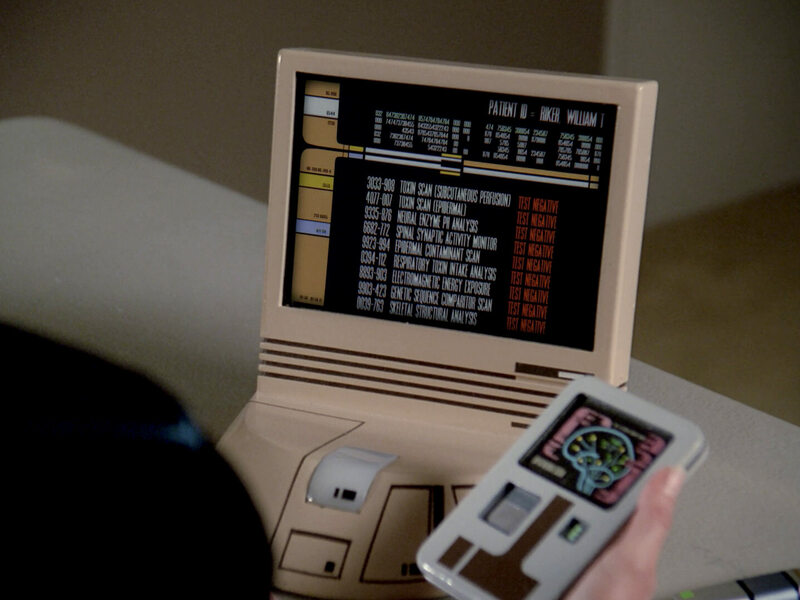 The shot also features a nice close-up of a PADD with medical information. 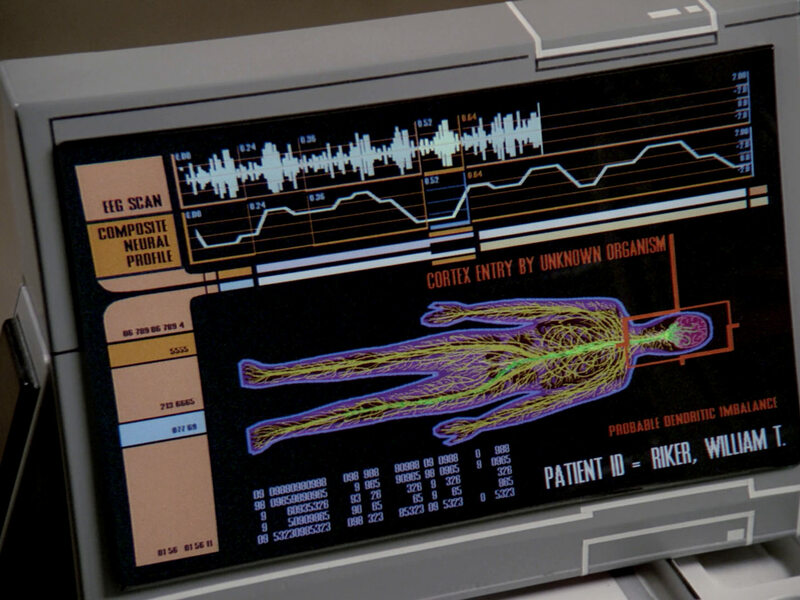 We can now read all items on the list. 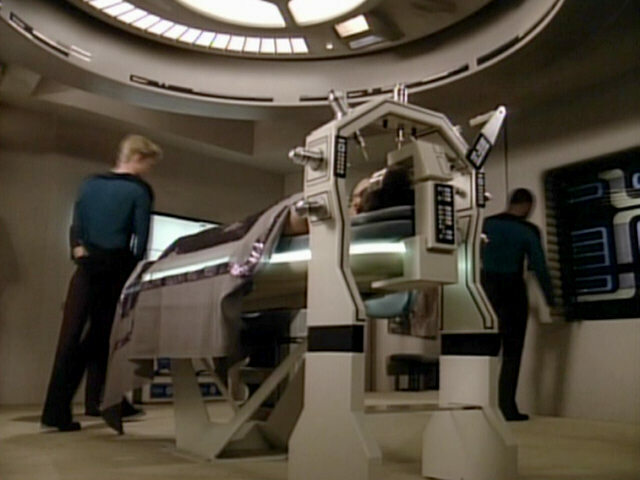 The large medical device Doctor Pulaski uses to pierce needles into Riker's head was later seen again in "Identity Crisis". 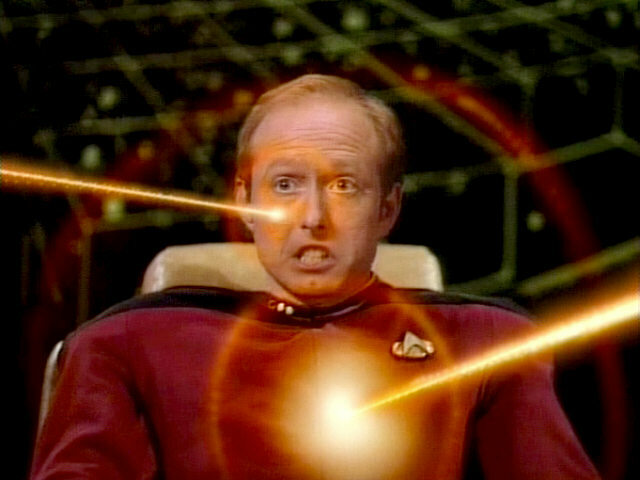 The ocular is no longer present in that later re-use. 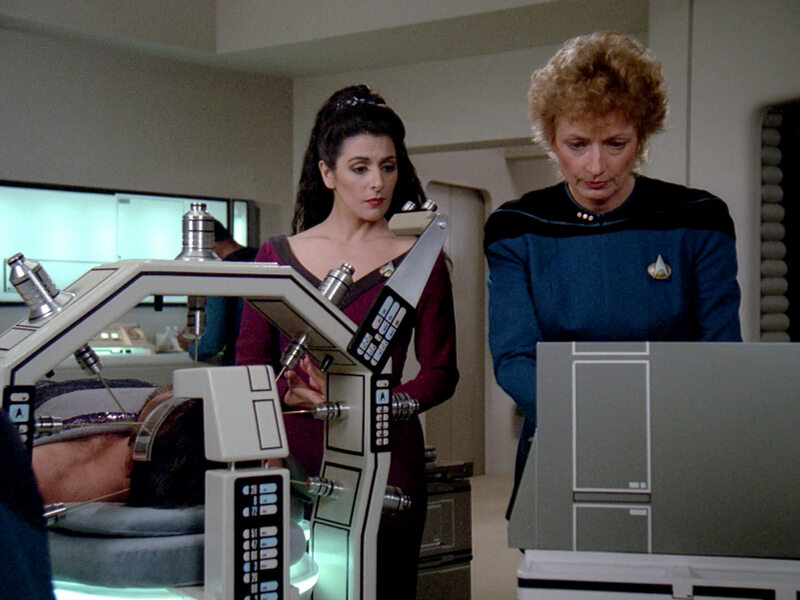 "Identity Crisis" A better look at this device in HD. 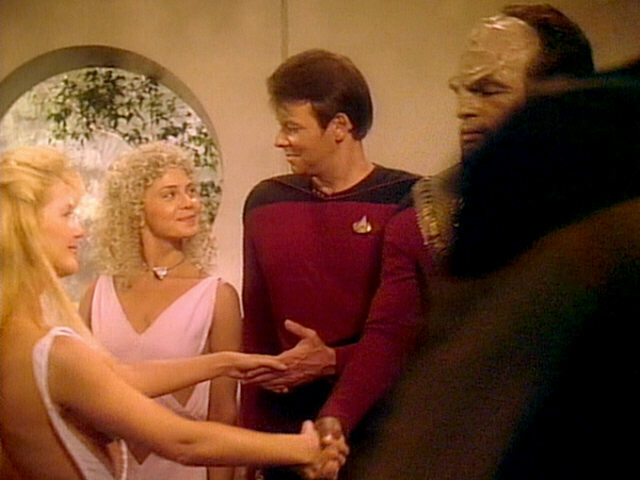 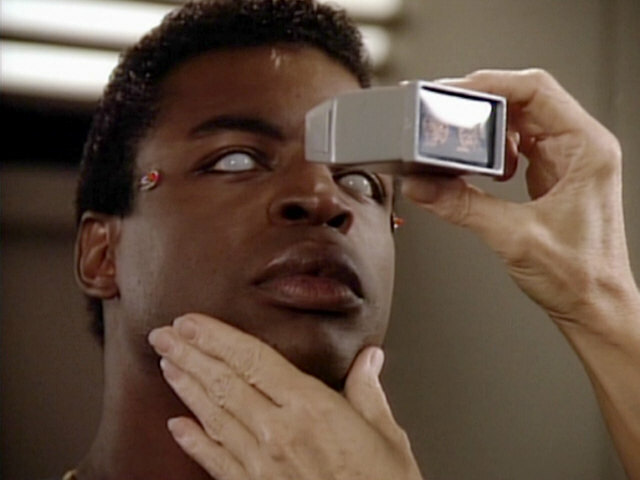 The ocular itself was first seen in "The Big Goodbye" where it is part of the device Wesley uses to scan the holodeck circuits. Goodbye" A close-up of the prop in HD. 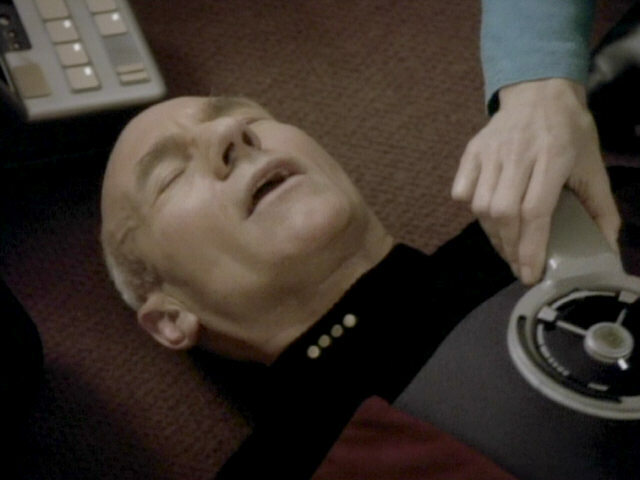 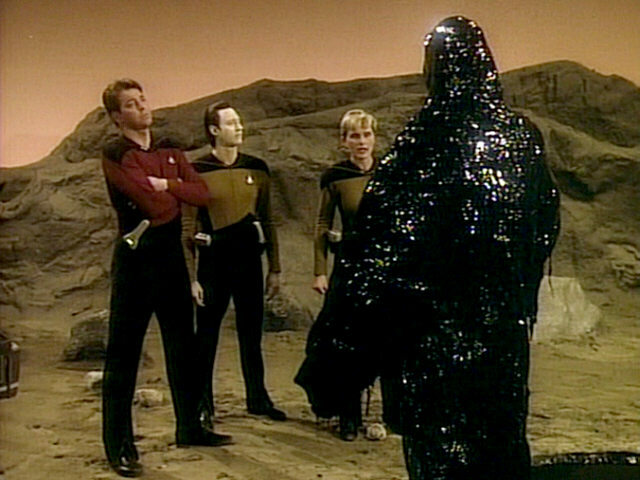 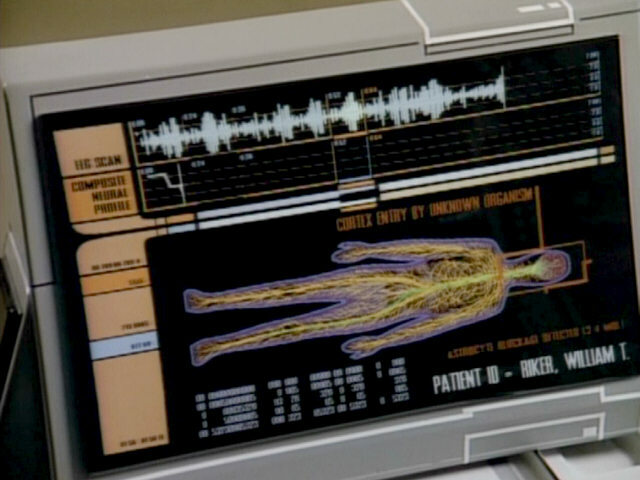 A scan of Riker's complete body. 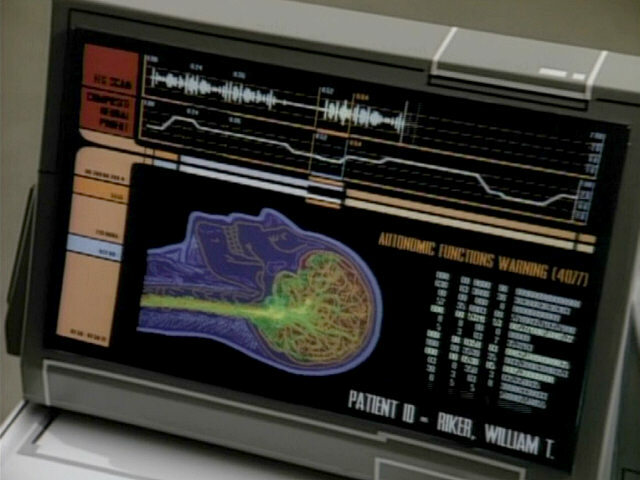 These medical scans too can be seen much better in HD. 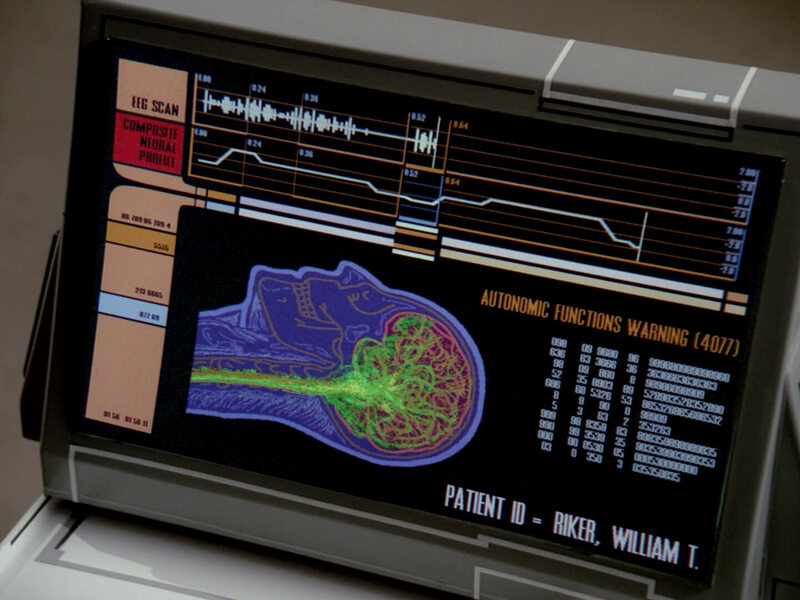 A scan of Riker's brain showing the infected regions. 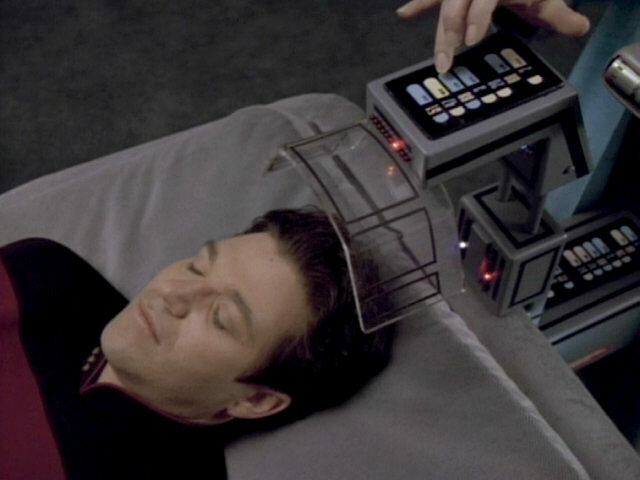 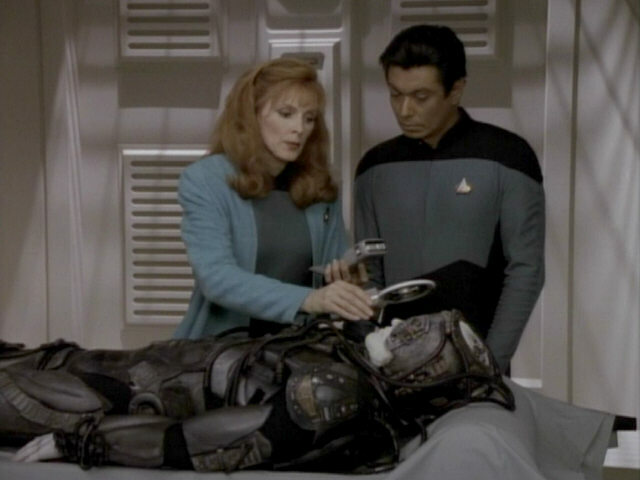 The medical device with the transparent hood that is directly attached to the biobed makes another appearance in "Conundrum" when Dr. Crusher uses it to restore Keiran MacDuff's memories. 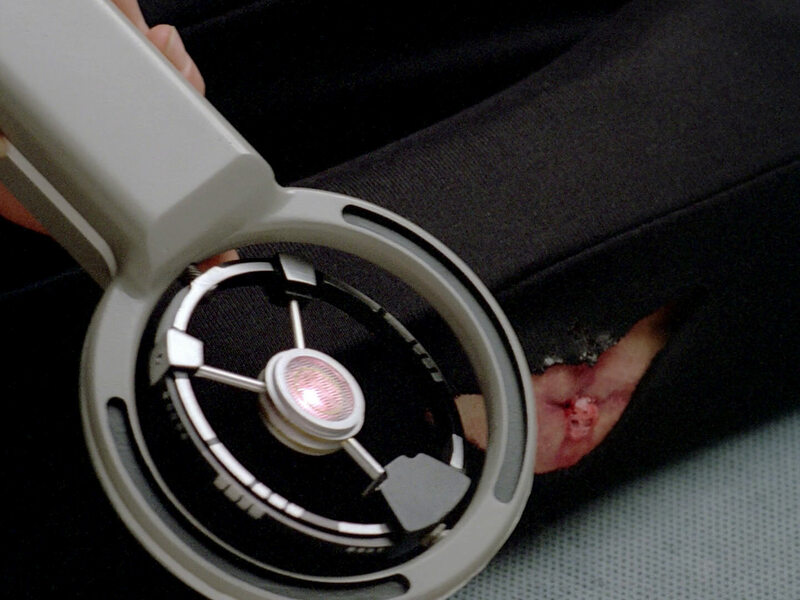 The prop also appears as a medical device attached to a table in "Transfigurations". 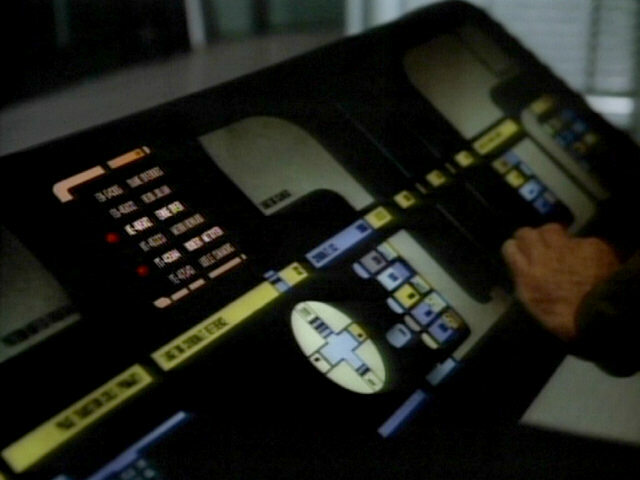 "Conundrum" A close-up of the prop in HD. 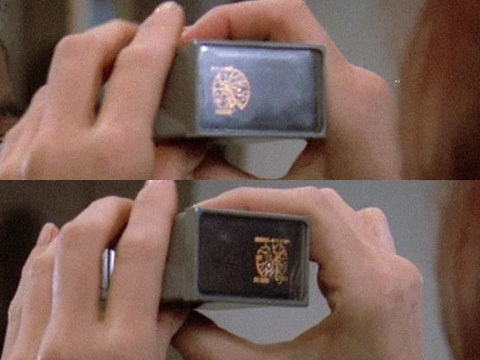 The autonomous function warning (4077) is a reference to M*A*S*H. We can see the 4077 better, among other details. 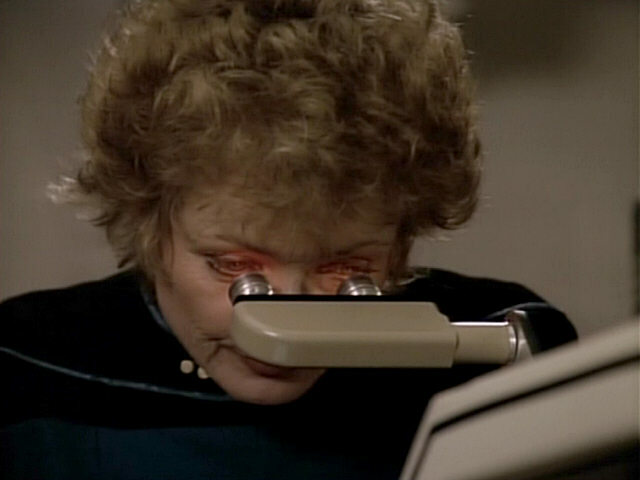 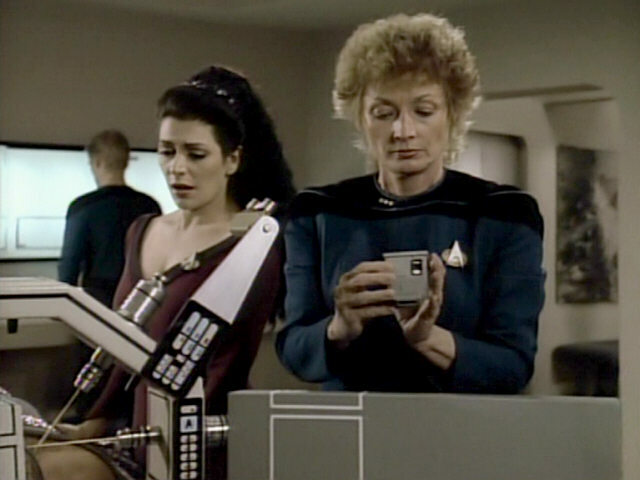 The scanner Doctor Pulaski uses in this shot was also used by her and Doctor Crusher to scan Geordi's eyes in "Loud as a Whisper" and "Encounter at Farpoint" respectively. 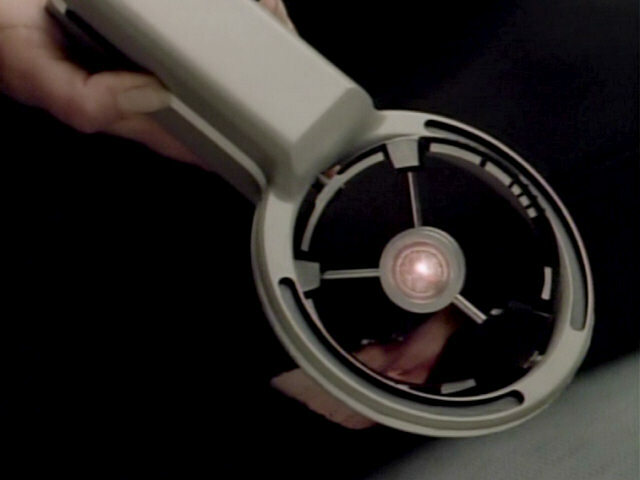 Whisper" A close-up of the prop in HD. 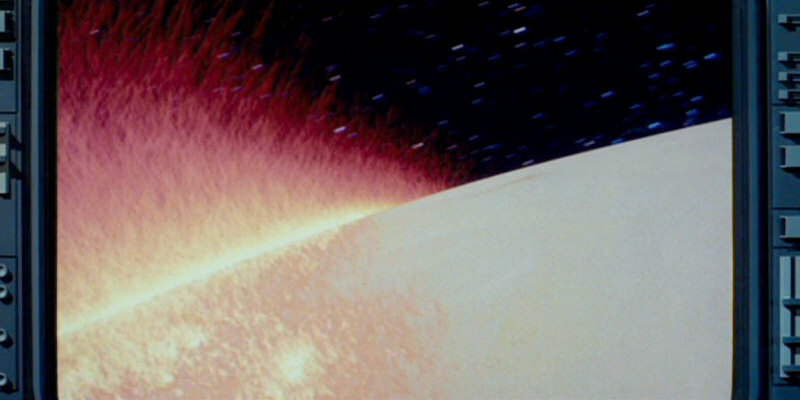 This shot of the Genesis wave transforming a planet, taken from "Star Trek II: The Wrath of Khan", is the only footage used in this episode that was not sampled from a TNG episode. 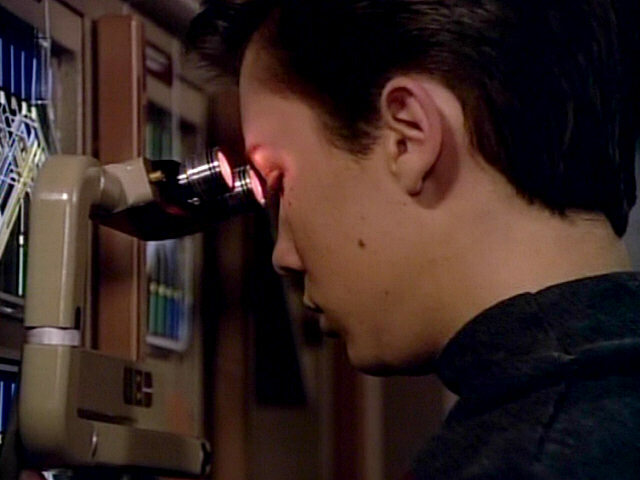 Footage from this sequence also appeared during Data's psychotronic stability evaluation in "The Schizoid Man". 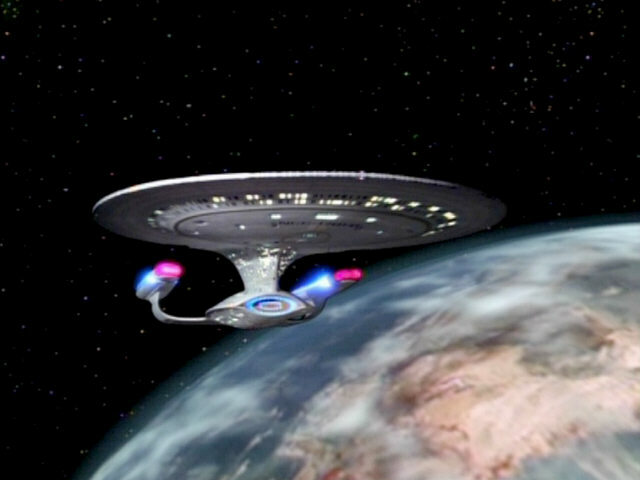 A final shot of the USS Enterprise-D in orbit of Surata IV. 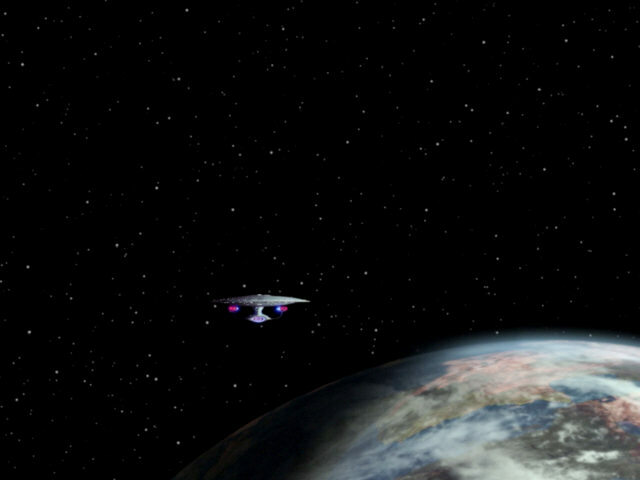 "The Augments" The new planet from yet another angle. 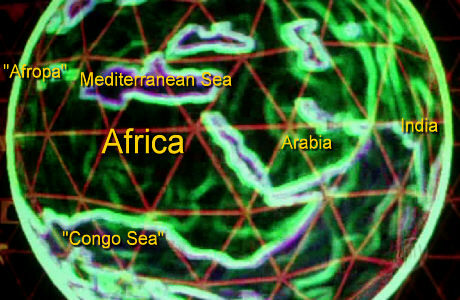 We can now see the western part of the Mediterranean Sea, with a big land mass "Afropa" connecting Africa and Europe in the place of Italy. 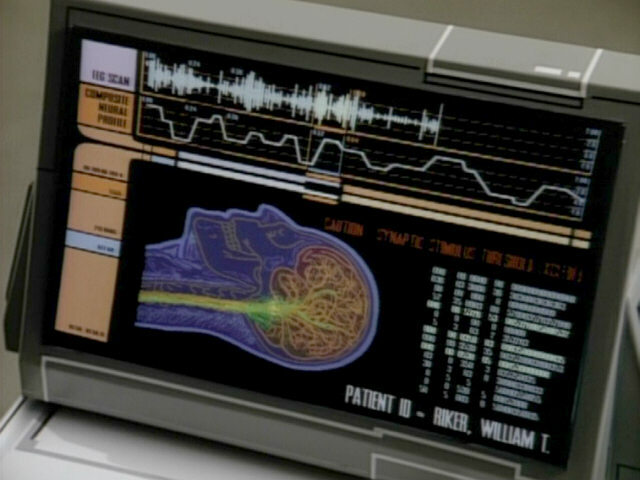 This is most likely the modified Earth whose map was already visible in ENT: "The Augments" and of which portions could be seen in "Divergence".